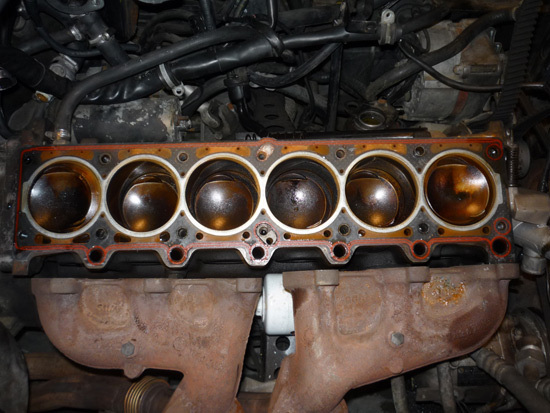 This is the step by step process for a complete tear down and rebuild of an 1988 E30 325i cylinder head. I’ll try to point out all the tips and tricks throughout the process to save time and unneeded wrenching. A little history on the car: I bought it from a friend of mine for $1,000. He had neglected his timing belt change so it eventually snapped and bent about 6 valves. The car shop quoted him $3,000 for a new motor. 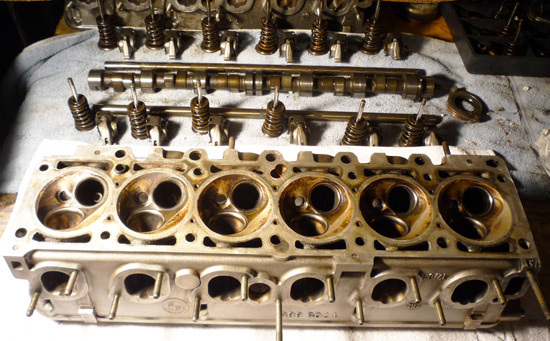 I gladly offered 1/3 of that thinking that I could buy a new cylinder head and be done with it. Things don’t always go as planned. 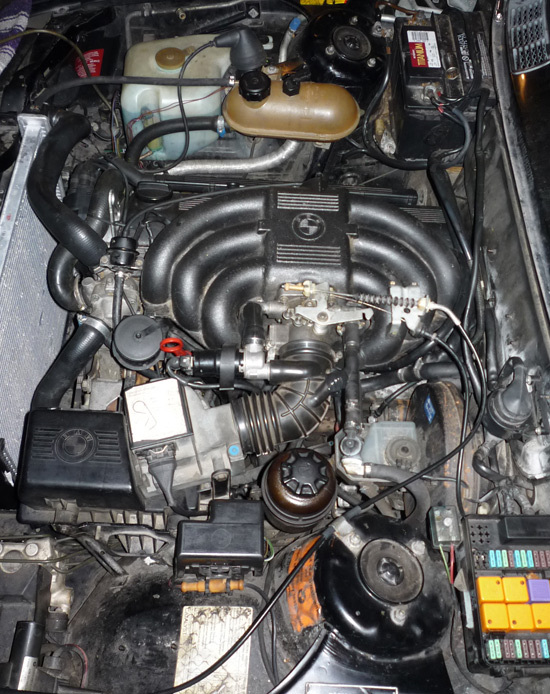 Valve cover, exhaust manifold and intake manifolds removed. 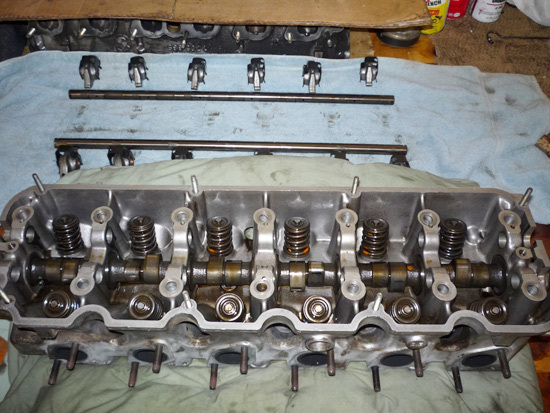 Cylinder head removed. Used head gasket still on the block. 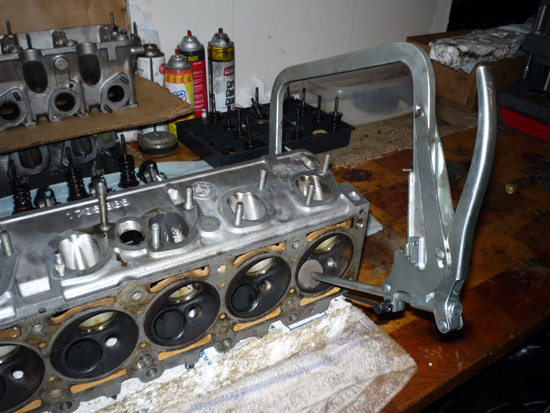 The cylinder head is placed on its side on a workbench. Be careful not to place the head on the oil line or upside down on the table. 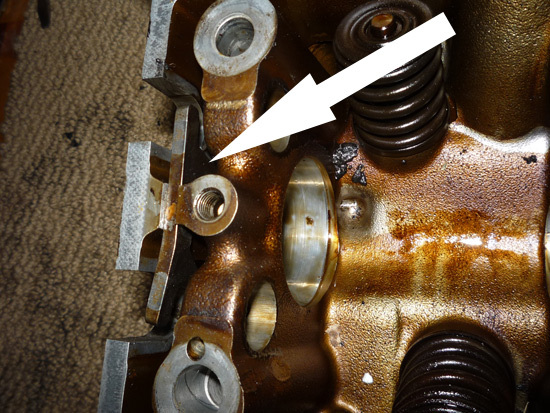 When the timing belt broke it caused interference between the piston and the bottom of the valve. 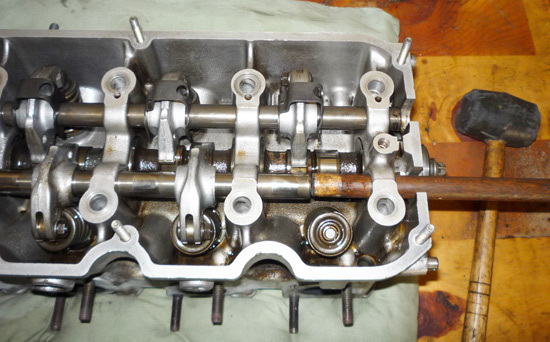 The valve stem is slammed upward into the compressed valve and rocker arm. 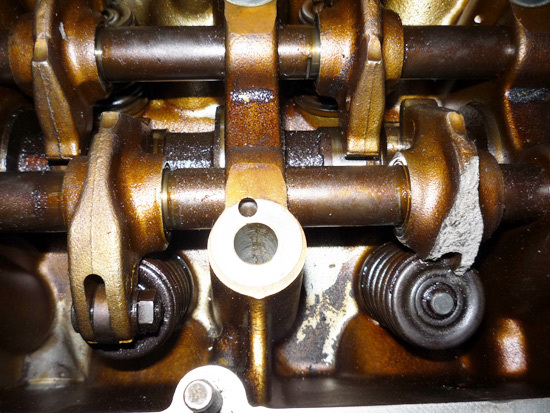 On the right you can see the broken rocker arm. This is the oil line I mentioned a few pictures ago. Loosen the valve tension by loosening the 10mm nut shown here. 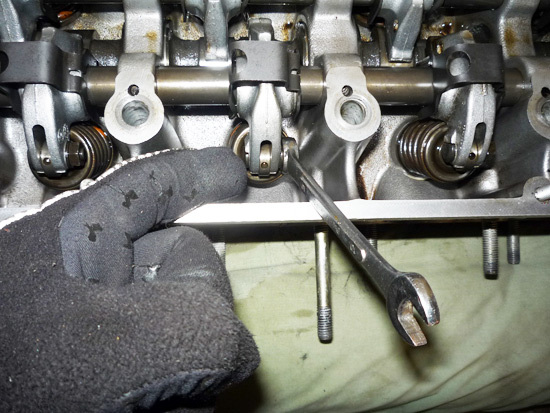 When you’re ready to drive the rocker arms out of the cylinder head make sure you remove the retaining clip from the end of the head (cam gear side). The head is cast aluminum and will break VERY easily. 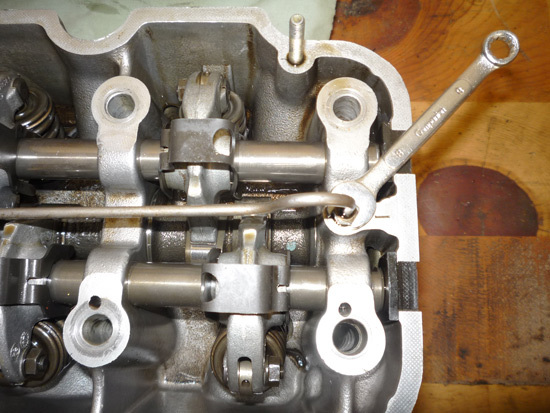 Use a suitable dowel rod to drive the rocker arm shafts out of the head. Repeat the steps from above to remove the intake side. 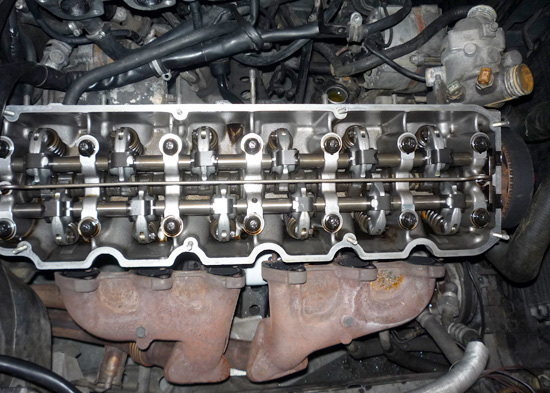 With both rocker shafts and rocker arms removed you can now remove the camshaft. Just go slow. Now you need a valve spring compressor to remove all the valve springs and retaining collets from the top of the valve stem. 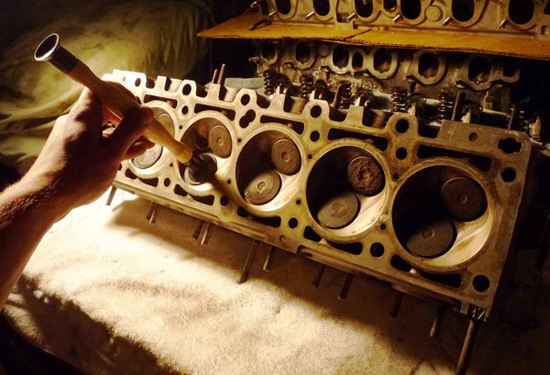 Now with everything removed you can focus on cleaning the head or if it’s cracked you can start working on your cylinder head coffee table. Clean the inside and outside thoroughly so that you can inspect it for any cracks or gunk. 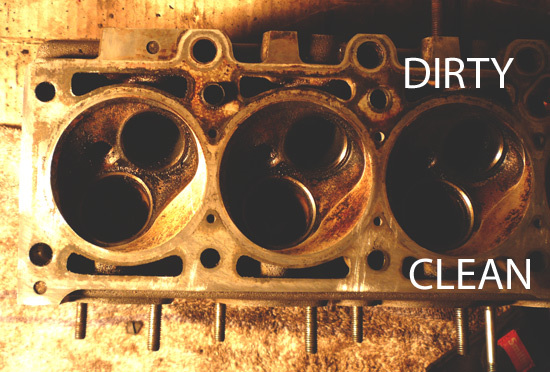 Use a sharpening stone to clean the bottom side of the cylinder head. Next go get yourself some lapping compound and a valve lapping stick. 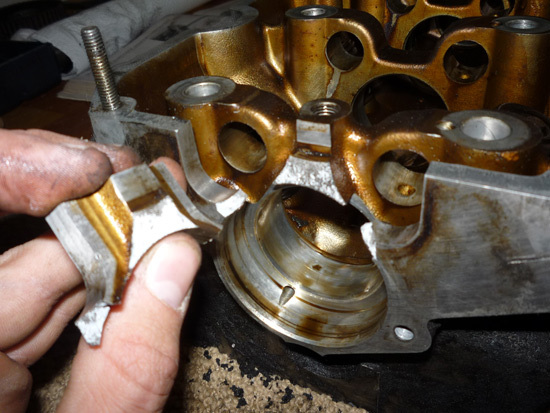 Be careful to only use a tiny bit of lapping compound and make sure you clean out all the compound once the valve seat has been reground. This is my workspace in the basement. 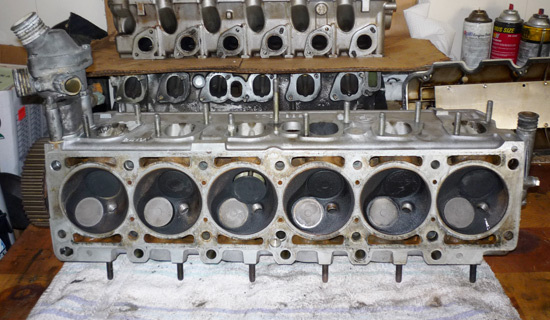 Notice the clean spot on the inside left of the closest cylinder head.